Members of the Mater Dei WYSE Team that took 2nd Place at the McKendree sectionals include (front) Adam Holbrook, Drew Logullo, Zoe Timmermann, Hannah Albers, Anna Lampe, Mackenzie McCray, Elizabeth Medlin, (back) Josh Wieter, Ian Bruening, Luke Foppe, Zach Peek, Ben Lampe, Shannon Mensing, and Michele Thole. The Mater Dei WYSE Team advanced to the state finals at the University of Illinois by finishing second in the McKendree Sectional on Monday, March 11. In Biology, Adam Holbrook and Hannah Albers tied for first place. In math, Hannah Albers finished in third place. In English, Mackenzie McCray finished in first place and Adam Holbrook finished third. In computer science, Luke Foppe won the third place medal. 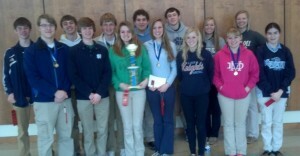 This makes back-to-back trips to State for the WYSE Team. The WYSE Team will compete at the University of Illinois on Tuesday, April 9.